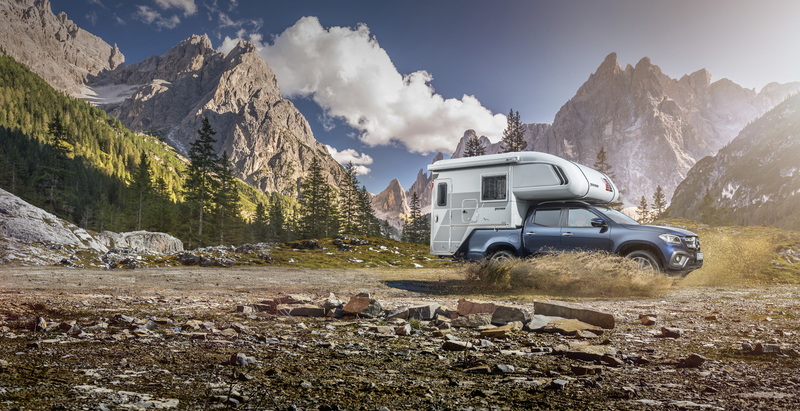 There probably aren’t many reasons to get yourself over to Stuttgart for the Caravan, Motor, Touristik Show later this month however, the promise of two Mercedes-Benz X-Class-based camper concepts has certainly piqued our interest. After its unveiling last summer, it hasn’t taken long for two bodybuilders (no, not the Arnold Schwarzenegger type) to get to work on Merc’s premium pickup. 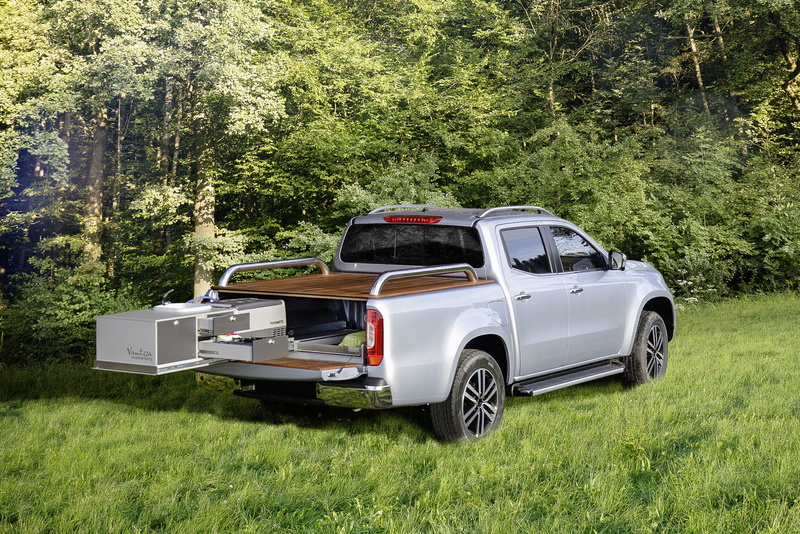 Tischer’s concept involves a removable cabin mounted over the X-Class’ bed. While aesthetically diminutive, the tardis-like design features a 150cm-wide sleeping alcove and almost two metres of headroom. There’s also a kitchen with a three-burner gas stove and a trio of folding seats, the latter able to turn into a second bed in a few moves. Incredibly, the Tischer camper design even includes a foldaway wash basin, swivelling toilet and integrated bathroom, complete with shower. It’s likely to be super cosy too, so definitely one to share with a long-term partner, rather than a casual surfing buddy. While Tischer has looked at the practicalities of off-road, overnight camping, the second Mercedes-Benz X-Class camper concept – created by VanEssa mobilcamping – is more suitable for those wishing to sleep under canvas. 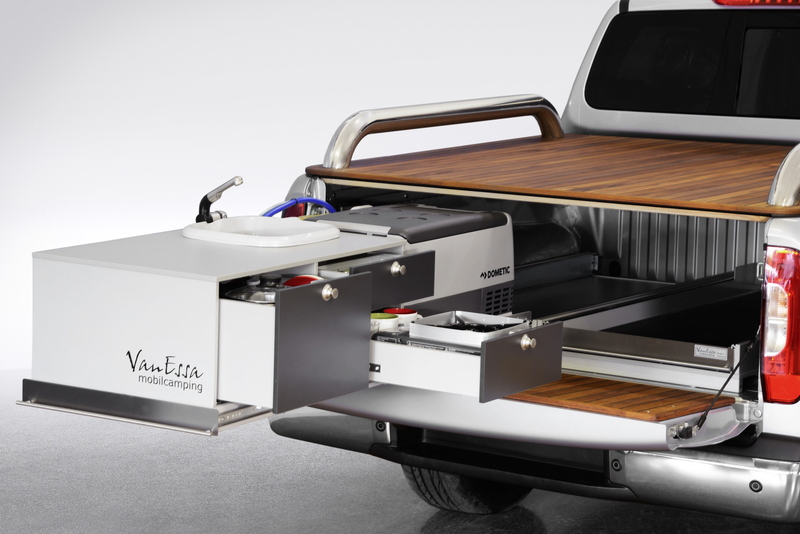 Using a 250kg pull-out module in the rear, VanEssa have turned the X-Class into a mobile kitchen good enough for Gordon Ramsey, complete with cooking and washing up facilities, a coolbox and a multitude of storage options for crockery, food and camping supplies. When not in use, the module is protected in the pickup’s bed by a speedboat-style teak deck (upon which a roof tent can be fitted for overnight adventures). While neither concept has yet reached production, if you’re looking to take your camping trips into the wilderness, you might not have to wait too long for a one-size-fits-all solution.